The years between 1893 and 1906 were particularly trying for the missionaries. There were a lot of deaths, replacements were slow in coming and funds were low and scarce. The sustainability of the mission was in a crisis, which was mitigated only by the participation of lay converts, who spread the new faith wherever they went… from the coastal town inland. Fr. Maximillian Albert succeeded Fr. Michon, who died in the Yellow Fever outbreak, as the new Prefect Apostolic (head of mission). Only five priests had survived the Yellow Fever outbreak. The Gold Coast mission needed more personnel (priests and nuns) and more funding beside the yearly grant of 800 from the Propaganda Fide and 320 from Holy Childhood. For the overheads were many. Teachers needed to be paid, school material bought, medicine procured, buildings repaired etc. Accordingly, Fr. Albert traveled to Europe to appeal for help in France, Belgium and Germany. After a year Fr. Albert returned with new missionaries, more Sisters and money. Part of this money financed a new mission house on St. Francis de Sales hill, Cape Coast, to replace the rented house at Inkum. • Cape Coast was the Central Region and all government offices were there. • Cape Coast had better road links to the interior. After twenty years of self-sacrificing hard work (from 1880 to 1900, thirty priests and nuns had died) there were four residential stations (Elmina, Cape Coast, Keta and Saltpond), with a Catholic population of 4905. in appreciation this missionary zeal and hard work, the Holy See elevated the Prefecture Apostolic, which the Gold Coast mission had been, to an Apostolic Vicariate of the Gold Coast. Thus, the mission would now be administered on behalf of the Holy Father by a Bishop, who would be the head of mission. This was Fr. Maximilian Albert; and so, on May 12, 1901, he was consecrated the first Bishop of the Gold Coast. Cardinal Peter Kodwo Appiah Turkson, a former Archbishop of Cape Coast (Ghana), was born on 11 October 1948 in Wassaw Nsuta, Ghana. He was ordained for the Diocese of Cape Coast on 20 July 1975 and holds a doctorate in Sacred Scripture from the Pontifical Biblical Institute, Rome. From 1975-1976 and 1980-1981 he served as staff member at St Theresa’s Minor Seminary, and from 1981-1987 as staff member at St Peter’s Major Seminary. On 6 October 1992 he was appointed Archbishop of Cape Coast and was ordained on 27 March 1993. 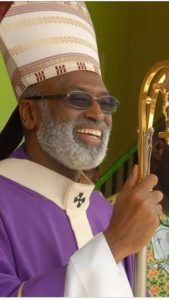 He served as President of the Ghana Catholic Bishops’ Conference (1997-2005) and member of the Pontifical Commission for Methodist-Catholic Dialogue; Chancellor of the Catholic University College of Ghana; member of the National Sustainable Development, Ministry of Environment; member of the Board of Directors of the Central Regional Development Committee and treasurer of the Symposium of Episcopal Conferences of Africa and Madagascar (SECAM). Created and proclaimed Cardinal by John Paul II in the Consistory of 21 October 2003, of the Title of S. Liborio (St. Liborius). Pontifical Commission for the Cultural Heritage of the Church. Two SMA Fathers had been taking care of Accra since 1926, but it required more hands and greater presence. Its mixed population of different tribes and languages called for specialized ministries. Therefore, in 1939, the SMA Fathers ceded the pastoral care of Accra to the SVD Fathers, Accra, with its principal stations of Koforidua, Nsawam and Akim Swedru, and their outstations were entrusted to the American SVD Fathers. Bishop Hauger retired on 24 th October 1932 on account of ill health; and he was succeeded by Bishop William Thomas Porter, a former supervisor of mission schools in Nigeria. He arrived on October 31, 1933 to take possession of this vicariate. • The unveiling of a memorial in the memory of the missionaries. On 12 th April 1906, Bishop Hummel succeeded Bishop Klaus as Apostolic Vicar of the Gold Coast. Lay Catholics had spread the faith far and wide, and communities had sprung up all over. The method for extending pastoral care to these communities consisted in setting up residential stations, whose priests organized visits to the villages and outlying communities. For whatever it was worth, Catholic presence in and around El-Mina would be practically snuffed out by the Dutch with the defeat of the Portuguese and the capture of the castle in 1637. When Holland got involved in the trade with the Guinea coast, she made use of Portuguese and Spanish ports. With the defeat of Portugal by Spain at Alcantara in 1580, however, the king of Spain took over the administration of Portuguese interest and forbade the use of Portuguese ports along the guinea coast by the Dutch. As a result, the Dutch developed their own ports along the Guinea coast, at Shama, Kormentse and Moree in 1612, and tried unsuccessfully to capture the Sao Jorge castle at El-Mina in 1625. in 1637, the Dutch attacked the Sao Jorge castle a second time, and succeeded in capturing it. All the Portuguese who were found in the castle, with their African wives and children, were all banished to Sao Thomé. The vicar and the other missionaries were later deported to Brazil, to Pernambuco.